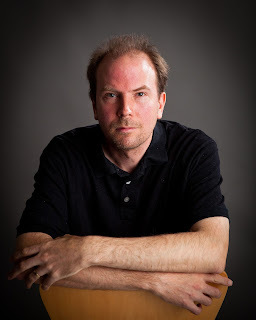 In addition to writing novels, Mr. Lawrence also writes short stories and poetry (click the links to read several of each). > What can readers expect from your Broken Empire trilogy? I think a lot of authors find this a hard question to answer. Authors like to talk about the writing. Talking about the story is more difficult because it's asking for hundreds of thousands of words to be shoe-horned into tens of words. The Broken Empire trilogy is about a charming, dangerous, and amoral boy growing into a charming, dangerous, and amoral young man. On the journey he cuts down pretty much everything and everyone who gets in his way, and he's rather creative when it comes to the business of killing. 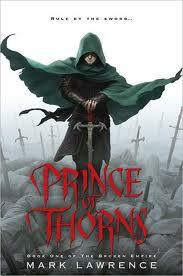 Where Prince of Thorns differs from a lot of fantasy books is that the story is the main character, Jorg. It's as much about who he is and why he is as it is about what he does. There's no evil overlord threatening the goodly lands of Generica. There are no dragons, no fireworky mages spewing out magic like they just ate a bad spell. Our protagonist is a nasty piece of work and no crime seems too bad for him if it’s a path to his goals. He makes no apologies for his actions and isn’t seeking redemption. However, if you read between the lines he delivers, you discover a new perspective on him that whilst it doesn't excuse his deeds, does go some way to explaining them. So, turning tens of words into ten, it's a violent enthusiastic fantasy with a deeper sub-text. > Why did you decide to make Jorg an anti-hero rather than a traditional hero figure? I find these tags of hero, anti-hero, and villain rather restrictive, as if fantasy were something laid out according to certain rules, when in reality it should be the least constrained of all fiction. The inspiration for the character came from Anthony Burgess’ A Clockwork Orange which also features a violent and amoral protagonist who confuses us by being at the same time charming and intelligent. I wanted to see if I could work a similar magic in a fantasy book. > You've worked in the field of artificial intelligence. Why do you write fantasy rather than science fiction? I still work in that field, but if I worked as a doctor should I then write medical dramas? Or if I were a lawyer should I write fiction about crime and judgement? If that were true who would we be left with to write fantasy? 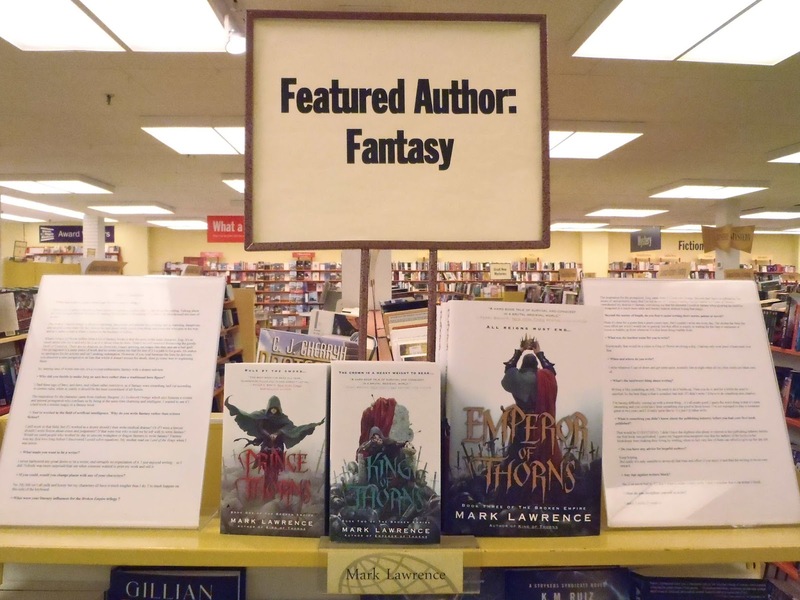 Would we need people who worked by day as unicorn wranglers or dragon farmers to write fantasy? Fantasy was my first love long before I discovered I could solve equations. My mother read me Lord of the Rings when I was seven. I never harboured any great desire to be a writer, and certainly no expectation of it. I just enjoyed writing – so I did! Nobody was more surprised than me when someone wanted to print my work and sell it. No. My life isn’t all milk and honey but my characters all have it much tougher than I do. I’m much happier on this side of the keyboard. 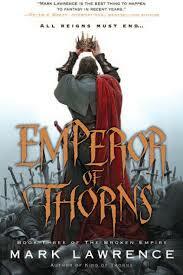 > What were your literary influences for the Broken Empire trilogy ? The inspiration for the protagonist, Jorg, came from A Clockwork Orange. Beyond that I have no influences I’m aware of, and probably many that I’m not aware of. Certainly reading George Martin’s A Game of Thrones reawakened my interest in fantasy, convincing me that the elements I loved in fantasy when growing up could be re-imagined in a much more adult and literary fashion without losing that magic. > Beyond the matter of length, do you find it easier writing short stories, poems or novels? When it’s time for a poem then a poem comes easy. But I couldn’t write one every day. The shorter the form the more effort per word I would say in general, but that effort is mainly in waiting for the idea or sentiment or vision to bubble up from wherever it is that these things bubble from. 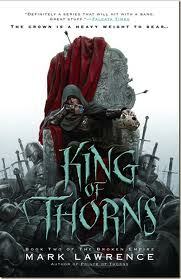 Emotionally that would be a scene in King of Thorns involving a dog. I had my only ever piece of hate-mail over that. I write wherever I can sit down and get some quiet, normally late at night when all my other duties are taken care of. Writing is like scratching an itch. The need to do it builds up. Then you do it, and for a while the need is satisfied. So the best thing is that it scratches that itch. If I didn’t write I’d have to do something else creative. I’m having difficulty coming up with a worst thing... it’s all pretty good. I guess the worst thing is that it’s time consuming and you could have done something else good in those hours. I’ve not managed to play a computer game in two years and I’d really quite like to. It’s just I’d rather write. That would be EVERYTHING. I didn’t have the slightest clue about or interest in the publishing industry before my first book was published. I guess my biggest misconception was that the authors of the books in the bookshops were making their living by writing, when in fact very few of them can afford to give up the day job. But really it’s only sensible to invest all that time and effort if you enjoy it and find the writing to be its own reward. No. I’ve never had it. If I don’t want to write, I don’t write. I don’t consider that to be writer’s block. I don’t. I write if I want to.